Accompanying the move to value-based care and reimbursement is the need to align economic and practice incentives to create accountability, says Cynthia Kilroy, senior vice president of provider strategy and business development, Optum. It is not just about volume, but about managing populations, and investing in capabilities and tools to manage populations. We are seeing five trends in the industry, with implications for each of them. First, there is a consolidation of the provider community that physicians are organizing, and then hospital systems or large integrated delivery networks (IDNs) are purchasing physicians. We are seeing both an affiliated and an employed model in the market right now. Another trend is system affordability. Premiums have been increasing significantly  more than 30 percent over the last five years. The challenge that CMS and some payors are focusing on is how to make healthcare more affordable to the community at large. A third trending area is value-based care, and aligning the economic and the practice incentives to create accountability. It is not just about volume, but about managing populations. This leads into the fourth trend, which is that provider organizations are investing in capabilities and tools to manage populations. Then the incentive models are moving more around that population care, which is more challenging to measure. Finally, there is a significant amount of interest in finding performance metrics. There is HCAHPS®. Every other payor is asking for different performance metrics from organizations; how do we focus that into the right incentive, especially from an incentive program for physicians? Each organization will be trying to achieve something different; each market is very different. I may see one provider organization focus in particular areas and disease states around quality. In other markets there might be something completely different. It is based on what is going on in that particular market and practice. "We transform a conversation of chronic disease into something patients can look forward to." Susan Lehrer, RN, CDE, NYCHHC House Calls. Guided by the philosophy, “Be real to your patients, and let them be real to you,” the New York City Health and Hospitals Corporation (NYCHHC) House Calls telehealth program is as committed to participants’ “life bottom line” as it is to its own program ROI. In the House Calls telehealth program for diabetics, patients’ blood sugar, blood pressure and weight are transmitted via hand-size wireless modems to a team of specially trained nurses who provide feedback and education during pleasant telephone conversations at scheduled intervals. A digital dashboard provides the telehealth nurses with a quick view of patients’ vitals and individuals who may be alerting. The telehealth technology enables immediate feedback that prevents overcorrection on the part of patients, Ms. Lehrer notes, while facilitating dramatic clinical outcomes. The telephonic exchanges augment regular patient visits and enhanced by the nurses’ use of motivational interviewing. The telephonic communications are “templated” to avoid long narratives. Ms. Lehrer presented some of House Calls’ clinical outcomes for the 2,500 patients it has serviced since the program’s inception during a July 2014 webinar, Diabetic Telehealth Monitoring: The Impact of Real-Time Data on High-Risk Patients sponsored by the Healthcare Intelligence Network. Most House Calls participants are diabetics who spend an average of two years in the program, she explained. Of a random sampling of 769 participants, 76 percent improved their A1C almost every three months. Additionally, of patients in that sampling with A1Cs between 11 and 13, 91 percent improved A1Cs by an average of 2.9 percent. House Calls, which has experienced a side benefit of fewer appointment cancellations on the part of participants, has been so successful the program already has been rolled out for patients with heart disease; its use for the chronic obstructive pulmonary disorder (COPD) population is being discussed. However, Ms. Lehrer is quick to point out barriers to telehealth still exist. Physicians who treat a patient with diabetes for years without seeing any real change can develop “clinical inertia,” she says, although this quickly dissipates once the doctor sees a patient engaged in House Calls. There is also the occasional patient resistant to change, and the frustration of being unable to integrate patient data into an electronic medical record (EMR). Still, despite the program’s focus on technology and results, the nurses remind themselves that at its core, House Calls is about the person at the other end of the line. Listen to an interview with Susan Lehrer here. Between 1995 and 2010, annual emergency room visits in the United States grew by 34 percent, while the number of hospitals with ERs declined by 11 percent, according to a new infographic from the George Washington University MHA program. The infographic also looks at the impact of overcrowding on U.S. emergency rooms, including the major causes of congested ERs and the impact on care delivery and proposed solutions to the problem of overcrowding. Evidence is lacking to support the effectiveness of public policy interventions based on performance measurement, such as public reporting of data and pay for performance. To succeed, emergency clinicians need to understand and practice in alignment with national performance measures. 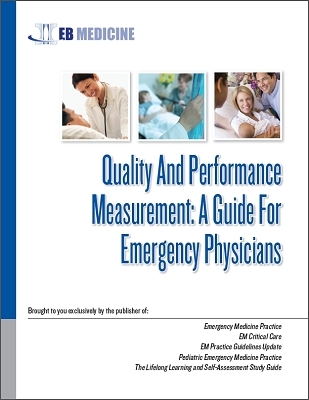 Quality And Performance Measurement: A Guide For Emergency Physicians reviews the origin and evolution of performance measurement, explains the current landscape of reporting, and discusses projections for future hospital quality measure implementation through 2014. Many patient-centered medical home (PCMH) initiatives have added home visits to care transition management to reduce avoidable hospital readmissions and ER utilization. Jessica Simo, program manager with Durham Community Health Network for the Duke Division of Community Health, describes likely candidates for home visits, the structure of a typical home visit and recommended staff training. HIN: Which diagnosis or patient profile benefits most from a home visit? (Jessica Simo) As a general rule for the patient population we serve, the people who get the most home visits are middle-aged individuals with at least two chronic health conditions. These are not generally healthy individuals who had one adverse event that brought them to our attention. These are people living day in and day out with chronic health problems they struggle with managing. Those people benefit the most from the amount of time it takes to do a home visit. HIN: What is the average length and typical format of a home visit? (Jessica Simo) The average home visit lasts 45-60 minutes. It would be longer for the initial home visit when an assessment is being donewhere the Care Partner (a partnering stakeholder from across the Duke University health system and the Durham community) collects information for the first time about medications the patient takes, their sources of support, ADL deficits, etc. Those visits tend to be a bit longer, certainly an hour at a minimum, but once that rapport has been established, the weekly visits are often less than an hour. They become briefer as a patient transitions from phase one to phase two of the Care Partners Pathway because there is less to talk about at that point. This is a good thing; it means they are improving. The home visits are structured around assessments and protocols, but as the home visits progress and the care partner becomes more familiar with the patient, there is less reliance on assessments and more on follow-up from the previous week. HIN: How do you prepare and train staff to conduct home visits? (Jessica Simo) The best way to prepare somebody to do home visits is to have them shadow a more experienced staff person. There are too many independent variables at play when you go into somebody’s home and you just don’t have control over that environment. Nor should you. It’s impossible to anticipate every possible scenario. Therefore, we do a lot of shadowing for at least a month before someone does a home visit on their own. Without the help of a care team, physicians would not have enough hours in the day to adhere to all the protocols for chronic care patients, according to a new infographic by Phase Space. 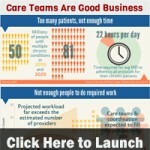 The infographic looks at the number of individuals with chronic conditions, the capacity of providers to care for these patients appropriately and how care teams fill these gaps. 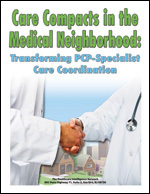 With the advent of the medical neighborhood, care coordination is no longer the sole domain of the primary care practice (PCP) but a responsibility shared among all providers that touch the patient. But how to formalize co-management of patients by PCPs and specialists ‒ in a way that both assures efficient delivery of high-quality healthcare and addresses the ‘pain points’ of each provider group? Every day in America millions of young adults use illicit substances, ranging from marijuana, heroin, and cocaine, to hallucinogens and inhalants. Out of the 35.6 million young adult population (from 2012) in the United States, one fifth used an illicit drug in the past month, and the percentage of those users has increased from 2008. The infographic below shows how often drugs are used daily in the United States and the number of first-time illicit drug users on an average day. Bringing the most comprehensive research and information available today to the mental health field, the Dartmouth Psychiatric Research Center and Hazelden have redesigned the innovative Integrated Dual Disorders Treatment: Best Practices, Skills, and Resources for Successful Client Care curriculum. Since healthcare is local, it’s vital that health systems engage local providers, enlisting both clinical and administrative champions, advises Julie Faulhaber, vice president of enterprise Medicaid at Health Care Service Corporation. Ms. Faulhaber offers a variety of guidelines for engagement of community partners in care coordination for Medicare and Medicaid beneficiaries. Our community care coordination partners may employ different models of care coordination. First, some may have care systems, larger accountable care organization (ACO)-type organizations; many take full financial risk, including risk on home- and community-based services. There are also waivers. Second, some of these large care systems also have nurse practitioner (NP) models that provide mainly facility-based care. Those can be extremely successful with outcomes for the numbers, as well as from a cost perspective. Third, we also work with care management organizations and providers. Another example would be the Triple A’sAdult Areas Agencies on Agingand other behavioral health organizations. In our experience, these organizations will take on some financial risk, but really for those care coordination services. Fourth, there are many different financial models you can use with both groups, particularly for the care management organization providers. For example, looking at a risk on care coordination, gain sharingpotentially in a new programhelping to pay for some startup infrastructure cost, providing loans with some paybacks. There are many different opportunities to make it financially viable for those important community partners to work with health plans in order to provide community-based, social model services to the member to meet all of their needs. Finally, when working with community partners, it is critical to have both a clinical and administrative champion for the program. Clinically, it helps to have a physician nurse who can talk with their peers in the organization to help them understand the program. Clinicians want to provide care in a very uniform way, but if there is an opportunity to provide additional benefits in lieu of services for members, it helps to have that clinician champion to be able to share that. Administratively, it is also important to manage the enrollment and care coordination paperwork. The plans are putting significant faith in these organizations to meet their contractual obligations, so having someone to follow up for those types of things is critical. It is also important to provide reporting and feedback on the results for these groups. We have done quarterly meetings in the past, which I found to be very helpful. It is also helpful to provide benchmarking data. We look at how one organization serving the same population in a similar environment shapes up in comparison to another. This has improved results overall; it makes those organizations leading the pack feel good, and provides those trying to catch up with some role models to look at. Physicians are becoming more proactive in managing their incomes by being more selective about insurers and patients and providing ancillary services. In addition, a small but growing number of physicians are moving toward cash-only practices. A new infographic from Medscape looks at these trends, along with details on how the Affordable Care Act is impacting physician practices, the income gender disparity among physicians and physician career satisfaction. In today’s value-based healthcare sphere, providers must not only shoulder more responsibility for healthcare outcomes, cost and quality but also align with emerging compensation models rewarding these efforts — models that often seem confusing or contradictory. The challenges for payors and partners in creating a common value-based vision are sizing the reimbursement model to the provider organization and engaging physicians’ skills, knowledge and behaviors to foster program success.